I went to my Gran’s yesterday and my Illumicrate box was sitting there waiting for me. 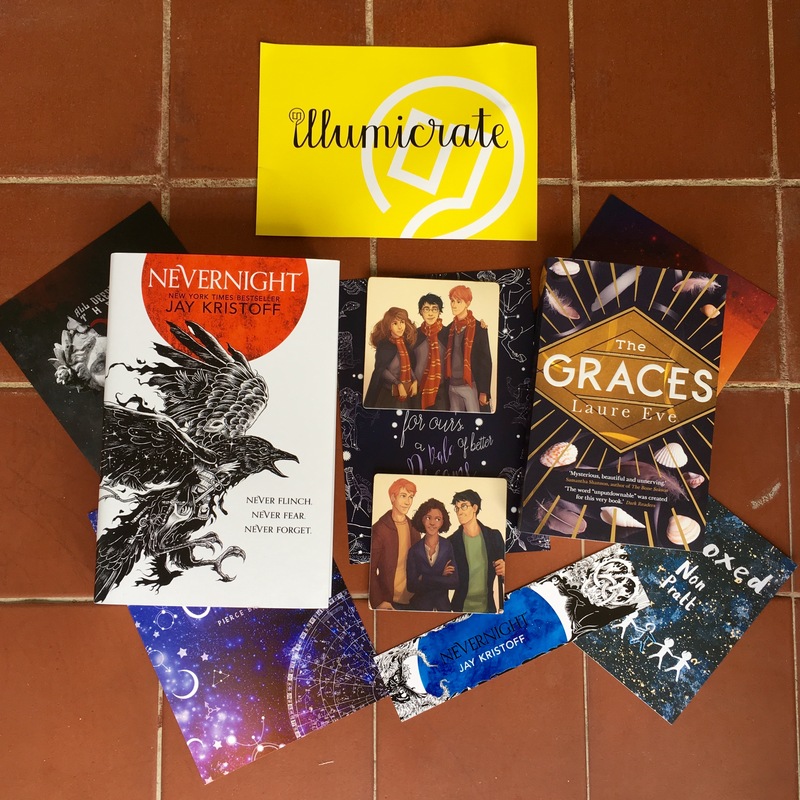 Illumicrate is a UK based subscription box for YA book lovers, the box is sent out every three months and you can find all the info about costs and shipping here. I’ve had the Illumicrate box for a while now and you can check out what was in the February box and the May box – so far I’ve only read one of the books I’ve received, hopefully I’ll catch up on the books I’ve received through various subscription boxes by the end of the year. I was really impressed with this month’s box. On social media it said it would contain two books, both of which would be pre-releases which is very cool, but I had no idea what books they’d be. The two books were Nevernight by Jay Kristoff and The Graces by Laure Eve. I’ve not read anything by Jay Kristoff before (Illuminae is currently sitting unread on my shelves) but wow Nevernight is such a beautiful hardback book I can’t really deal with it. The story sounds interesting too but really I just can’t get over how pretty this book is. The Graces is all about magic and witches and it’s not released in the UK till the beginning of next month! I like the sound of both books and I can’t wait to read them. Both books came with a signed bookplate and Nevernight also had a art card, bookmark and there’s a video from the author you can access while The Graces came with some temporary tattoos and a letter from the author. Now for the goodies, there’s a Gilmore Girls-inspired tote bag by Colorful Geekiness (a show I have never seen but have heard nothing but good things about), Colouring Quotes by Ashley Poston, a couple of amazing Harry Potter coasters from Taratjah Art (I love them so much!) and some Strawberry Tea from Post Tea that smells absolutely gorgeous – I’m not much of a tea drinker but I think I’ll have to make an exception and try this tea. There’s also some extras relating to Red Rising by Pierce Brown, Unboxed by Non Pratt and A Torch Against the Night by Sabba Tahir. There was supposed to be a sampler of A Torch Against the Night in all of the subscription boxes but the publisher was unable to send enough copies so in my box that was missing, however the lovely people at Illumicrate has it all sorted out and if you’re like me and didn’t get the sampler, you can contact them with your order number and they’ll send one out to you. I really do like Illumicrate, so far the books have all been new to me and in the case of When We Collided from May’s box, the sort of thing I wouldn’t normally pick up. It’s been nice receiving I’d never even heard of, books from new-to-me authors and from genres I don’t always read. I do get a bit worried about just getting more and more unread books and goodies that I won’t necessarily use but so far that hasn’t been the case. The next box will be sent out in November but you’ve got to be quick if you want one, they seem to always go super fast! I’ve ordered this months FairyLoot box too but it hasn’t arrived yet! I’m looking forward to seeing what’s in there.